ALL COPIES SOLD – thank you so much guys for all the support!! These are unopened packages – they won’t ship until Breyer ships. I will NOT inspect these or itemize issues – in part I’m offering for nearly the Premier Club cost as suggested to me rather than asking more and detailing everything with pictures…. my lack of time is your financial gain here! 🙂 Please reread that carefully before buying if you want a flawless copy. This offering is perhaps not best for you. I will leave these wrapped head and toe BUT am happy to sign. As with other sculptures I will write the standard signature (on belly) and can – if you want – add the print “MK Artists Copy #[2-9]” (see to left). I am keeping one boxed copy for myself and selling the rest – that’s 3 boxed selling today and 5 unboxed copies. SHIPPING IS EXTRA AND ACTUAL COSTS WILL BE CALCULATED AND BILLED VIA PAYPAL INVOICE. 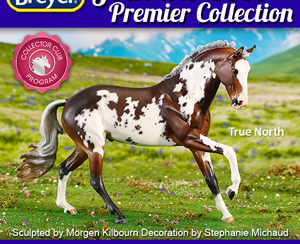 Breyerfest pickups are fine however if you wish instead. Boxes include COA from Breyer. Unboxed contain COA also. All horses have serial numbers as others sold to Premier Club members have. If any of the buttons below aren’t working please email asap to morgen@one-horse.net When sold each link should take you to a page that says item sold.